The second day of the Forefeast of Theophany falls on January 3. Today's hymns invite us to go in spirit to the Jordan River where the Creator comes to be baptized. He is the Light which shines in the darkness (John 1:5), and today He begins to overcome that darkness. From the Church hymns for this day: "The Word without beginning with the Father and the Spirit", "being humble", "already comes" "to bow his head to the servant and voluntarily be baptized in the flesh", "being encircled renewing man once again with a way of life" and "we who have been punished with death" "to enliven with the streams of the Jordan". "Heaven and the angelic hosts are seized with dread as they see you," "Christ comes like a servant to a servant seeking and asking for baptism". "Believers, shaking the sleep of evil from the eyelids of our souls", "tears in streams pouring out from our eyes", "cleanse our minds and contemplate the strange sight by partaking in the mystery", "Christ coming as a meeting to cleanse us in the streams of the Jordan". Be thou ready, Zabulon; prepare thyself, O Nephthalim. River Jordan, stay thy course and skip for gladness to receive the Sovereign Master, Who cometh now to be baptized. O Adam, be thou glad with our first mother, Eve; hide not as ye did of old in Paradise. Seeing you naked, He hath appeared now to clothe you in the first robe again. Christ hath appeared, for He truly willeth to renew all creation. 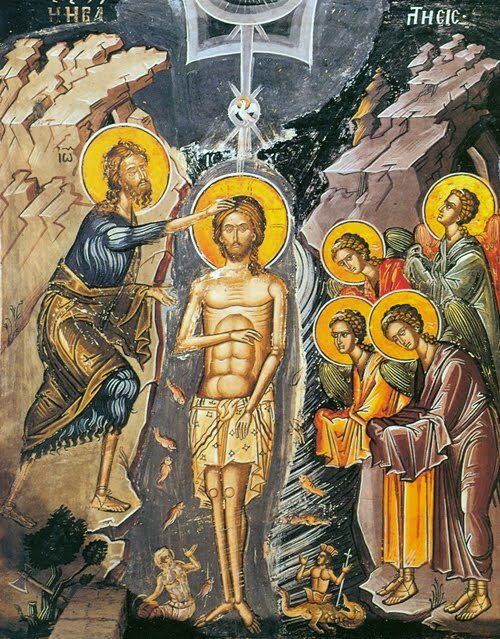 In the running waters of the Jordan River, on this day the Lord of all crieth to John: Be not afraid and hesitate not to baptize Me, for I am come to save Adam, the first-formed man.